How to sell a car in NC at top cash for car values ? Enter your zip code below to find out what your vehicle is worth now. North Carolina seems to have it all. It has Atlantic Ocean beaches and Appalachian Mountain retreats. There are historic small towns and large modern cities. But if you have a less than perfect car in the state, it can be troublesome to get around, and even harder to sell no matter where you live. Damaged cars are not sought after by private buyers and dealers are not in the market for salvage cars. You can find North Carolina junk car buyers at salvage yards but you may have to pay for towing and they will probably only pay for your car at “by-the-pound” scrap metal prices. So, there it sits in your driveway or backyard. It's time to do something about that eyesore and we've got the modern solution to cash for cars in North Carolina. We buy cars online at DamagedCars.com. DamagedCars.com had made over a million offers on cars throughout the country. We can get you a guaranteed online offer for your vehicle in less than two minutes. 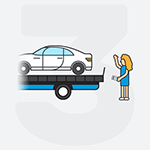 In less than two business days, we will pay for your car, pick up the vehicle and pay for towing! We have the solution to selling damaged and junk cars in North Carolina at DamagedCars.com. What Kind of Cars Do You Buy in North Carolina? Whether you have a sedan in Statesville, a truck in Thomasville, a minivan in Mount Airy or a car that smokes in Winston-Salem, we've got you covered. DamagedCars.com buys cars that have been in accidents, cars with blown engines and those with transmission issues. We buy junk cars online and we specialize in buying cars in any condition, including totaled cars, wrecked cars, salvage cars and more. 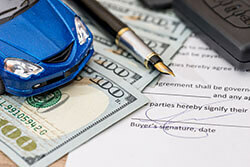 What Do I Need to Sell My Car in North Carolina? All you need is your title and the keys. A bill of sale or the car's registration is a plus. All you then need to do is take out your personal items and remove your plates. You get extra cash and your problem vehicle will be removed! How Much Can I Get when I Junk My Car in NC? If you have a damaged or non-running car or truck, North Carolina junk yards will likely just pay you scrap metal prices. If you want to maximize your return, connect with DamagedCars.com. We are damaged car evaluation experts. We will get you an offer based on your car's make, model, year and condition. We will also note any premium options or add-ons your car may have that sets it apart. You'll have a guaranteed offer within two minutes, right online! DamagedCars.com takes a situation that can be hassle-filled and we make it quick and easy. 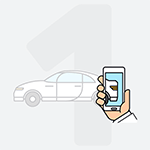 Sell your car online from the convenience of your home. We'll bring your payment to you and pick up the car. We even pay for towing. If we could make it easier we would! Did you know that Mount Airy North Carolina is the birthplace of Andy Griffith and served as the inspiration for Mayberry in the old Andy Griffith Show? The town has an annual Mayberry Days festival, features a barbershop named Floyd's and has an Andy Griffith Museum that averages about 200 visitors a day. Where Do You Buy Junk Cars in North Carolina? If you live in Charlotte, Raleigh, Wilmington, Greensboro, Asheville or the surrounding areas, we’ll dispatch one of our tow trucks to pick up your car and bring you your check. DamagedCars.com eliminates concerns about repair expenses or diminished value of your car. Plus, there are no hidden costs and no towing charges. Do you live in North Carolina and have a damaged car or a car with mechanical problems? Why not sell it? DamagedCars.com has been buying North Carolina’s damaged cars since 1985. We buy cars after collision damage, flood or storm damage, theft damage, mechanical problems or vandalism. DamagedCars.com makes it easy to sell your damaged car and get money for it without delay. Simply fill out our forms and you’ll receive a quote in 90 seconds. Did you know that it’s okay to keep your insurance check and sell your damaged car? If you live in North Carolina, we’ll buy your damaged car, even if you’ve already received reimbursement from your insurance company. Use DamagedCars.com to sell your car quickly and put double the money back in your pocket. Our goal is your goal, to help you get rid of your troublesome car, van, truck or SUV. Visit DamagedCars.com and fill out our online form. Get your offer in minutes. Once it is accepted, we'll make arrangements to pay you and get your vehicle within two business days. Imagine that smile on your face as you see that problem car heading off into the distance and you, with extra money in your pocket. Get started now by visiting DamagedCars.com. What if your car isn’t damaged, but it hasn’t passed the North Carolina Smog and Safety Test? You could spend the money on expensive repairs to ensure it passes inspection, or, you could sell your car to DamagedCars.com and get money instead. Just fill out our simple forms to get a free evaluation to sell your car to Damaged Cars. When we give you your check, go buy yourself a brand new car that passes the North Carolina Smog and Safety Test, without the hassle. To get a free quote just enter your vehicle's basic information. What should you know before selling to a junkyard or private buyers in North Carolina?